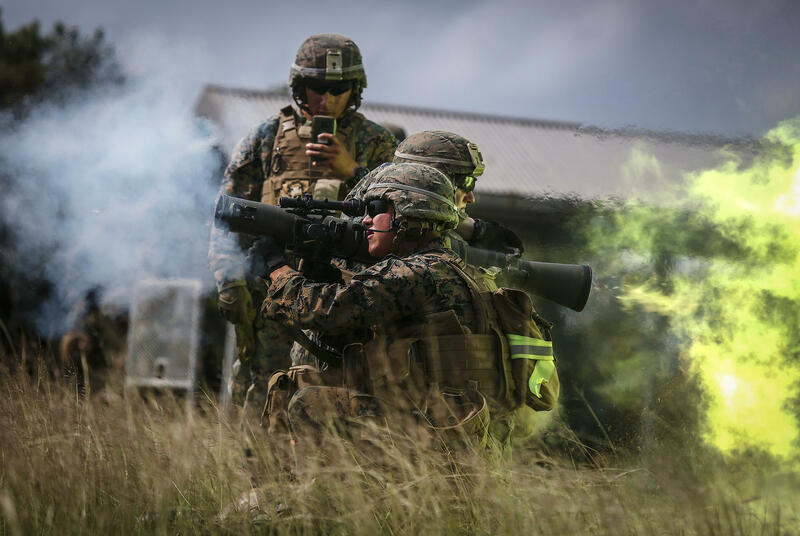 U.S. Marines fire the Carl Gustav rocket system during live-fire training last October. With each firing, the shooter's brain is exposed to pulses of high pressure air emanating from the explosion that travel faster than the speed of sound. Sgt. 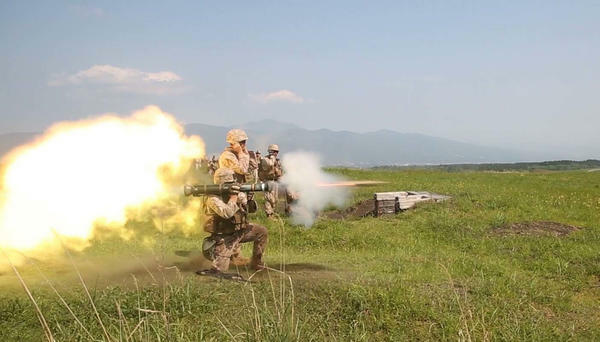 John Wagley fires an AT4 anti-tank missile during a training session at Camp Fuji in Japan. Studies find that some who fire these weapons repeatedly have short-term problems with memory and thinking. It's still not clear, scientists say, whether those temporary changes can lead to permanent deficits. "When you fire it, the pressure wave feels like getting hit in the face," says Paul Scharre, a former Army Ranger who directs the technology and national security program at the center. Scharre is a co-author of the center's report: Protecting Warfighters from Blast Injury. During the wars in Iraq and Afghanistan, military officials recognized that the blast wave from a roadside bomb could damage a person's brain without leaving any visible sign of injury. And in 2010, the Pentagon issued a memo outlining steps to improve care of troops exposed to these explosions. Since then, there's been growing evidence that blasts from weapons like the Carl Gustav recoilless rifle and the AT4 anti-tank weapon can also affect the brain. "If you're looking at a large anti-tank rocket that a soldier would carry on his or her shoulder, that's now a pretty large explosion — and it's happening right next to your head," Scharre says. Studies show that some service members who fire these weapons repeatedly have short-term problems with memory and thinking. What's not clear is whether those temporary changes can lead to permanent deficits. "If you're exposed to these weapons throughout the course of your military career, this might have some subtle and insidious long-term effect that doesn't materialize until later," Scharre says. The military is studying that possibility, and the new report is a part of that effort. But a definitive answer about the risks from firing weapons is probably many years off. The report says the military should make changes now, despite the uncertainty. One recommendation is much wider use of devices known as blast gauges, which measure the intensity of blast waves. The gauges are typically about the size of a wristwatch and service members attach them to their shoulders and helmet. "Every service member who is in a position where he or she might be exposed to blast waves should be wearing these devices," Scharre says. "And we need to be recording that data, putting it in their record and then putting it in a database for medical studies." Authors of the report also recommend steps to reduce service members' exposure to blast waves during training exercises. For example, they say, the military should reduce the maximum number of times a person can fire certain weapons in a single day, and over several days. The military should also look into a new type of helmet that's designed to protect the brain from blast waves, the report says. The findings of the analysis are no surprise to Kyle Sims, a former Special Forces medic who helped deploy blast gauges in Afghanistan. Sims realized something disturbing when he started looking into research on brain damage among football players who'd taken repeated blows to the head. "It's not that one time that the guy got knocked unconscious," Sims says. "It's the 500 times that the guy got hit prior to that." Sims is especially worried about service members involved in training others to fire heavy weapons. These people often spend entire days on a range where the weapons are being fired. One retired officer told Sims about a day of training when he'd been exposed to more than 100 blasts from anti-tank weapons. "When he got done talking, I said, 'Well, don't tell me — let me guess. At the end of the day you felt nauseous, you had a headache, you felt tired [and] all you wanted to do was take a Motrin, lay down and go to bed.' He's like, 'Yeah.' And I was like, 'Well, that's typical post-concussive symptoms there, buddy.' "
The military should start treating personnel exposed to blast waves the way it treats people who work around hazardous radiation, Sims says. In other words, set a limit to how much blast exposure a person can receive during their military career. "If there was a hazard in the civilian world for workers to be exposed to blast overpressure, we would have had a standard in place decades ago," he says. An Army spokesperson tells NPR the military is reviewing the report and will offer a response and recommendations. There's a new report out today that finds that people in the military may be putting their own brains at risk when they fire certain high-powered weapons. Here's NPR's Jon Hamilton. JON HAMILTON, BYLINE: They look like bazookas, and they're good at jobs like blowing up an enemy tank. HAMILTON: But Paul Scharre, at the Center for a New American Security, says there's a downside to this sort of weapon. PAUL SCHARRE: When you fire it, the pressure wave feels like getting hit in the face. HAMILTON: Scharre should know. He was an Army Ranger in Iraq and Afghanistan. Now he's a co-author of the center's new report, "Protecting War Fighters From Blast Injury." The report was commissioned by the Army. It looks at injuries caused by blast waves, pulses of high-pressure air that come from an explosion. The blast wave from a bomb can damage a person's brain without leaving any visible sign of injury. And Scharre says there's growing evidence that the blast wave from certain weapons can also affect the brain. SCHARRE: If you're looking at a large antitank rocket that a soldier would carry on his or her shoulder, that's now a pretty large explosion, and it's happening right next to your head. HAMILTON: Scharre says small studies have found that people who fire these weapons repeatedly can experience short-term problems with memory and thinking. SCHARRE: If you're exposed to these weapons throughout the course of your military career, this might have some subtle and insidious long-term effect that doesn't materialize until later. HAMILTON: Might. No one knows, and a definitive answer is years off. Even so, the report says military officials should make changes now. It recommends much wider use of devices known as blast gauges. They're about the size of a wristwatch and are usually worn on a service member's helmet and upper body. Scharre says the gauges offer a way to quantify exposure to blast waves. SCHARRE: Every service member who is in a position where he or she might be exposed to blast waves should be wearing these devices. And we need to be recording that data, putting it in their record and then collecting that data in a database for medical studies. HAMILTON: The report also recommends reducing the number of times a person can fire certain weapons in a single day and over several days, and it suggests efforts to develop helmets that protect against blast waves. The report's findings are no surprise to Kyle Sims, a former Army medic who helped deploy the first blast gauges in Afghanistan. Sims says he realized something disturbing while studying brain damage in football players. KYLE SIMS: Holy cow. It's not that one time that the guy got knocked unconscious. It's the 500 times the guy got hit prior to that that he didn't get laid out on a field. HAMILTON: So repeatedly firing a heavy weapon might be as risky as being knocked out by a roadside bomb. Sims is most concerned about service members involved in training others to fire these weapons. He says one retired officer told him about a day when he'd been exposed to more than 100 blasts from antitank weapons. SIMS: When he got done talking, I said, well, don't tell me. Let me guess how you felt. At the end of the day, you felt nauseous. You had a headache. You felt tired. All you wanted to do was go take some Motrin, lay down and go to bed. He's like, yeah. I was like, well, that's typical post-concussive symptoms there, buddy. HAMILTON: Sims says the military should treat blast waves like radiation. That means first measuring the exposure and then setting limits. An Army spokesperson said the military is reviewing the report and will offer a response and recommendations. Jon Hamilton, NPR News. Transcript provided by NPR, Copyright NPR.